~ 2.2 GHz Octa-core Cortex-A73 Processor. ~ Dual 16 MP + 2 MP Rear & Dual 24MP + 2 MP Front Camera. ~ 4 GB of RAM & 128 GB of internal storage. ~ 3340mAh non removable battery. In Bangladesh the second popular mobile brand is Huawei. Because of its affordable price, latest technology, and the best quality design. Earlier success of Huawei Bangladesh the Chinese phone company brings another new technology smartphone. And it is Huawei Nova 3i. As we know Nova is there mid-range smartphone series. The great thing about Nova 3i is its four AI camera. Huawei Bangladesh also highly promotes their this features. 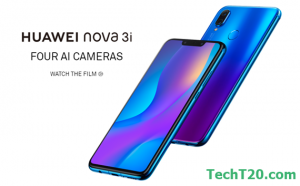 Huawei Nova 3i is best for selfie shooter, the cause of its dual front-facing AI cameras. It is the first four AI camera smartphone in Bangladesh. That’s the inside reason they releasing more high-end technology based mobile phones. This smartphone also getting huge popularity in Bangladesh market. First, Huawei Nova 3i runs on Android 8.1 Oreo operating system with 2.2 GHz octa-core HiSilicon Kirin 710 fastest processor. Second, This phone comes with 6.3 inches full FHD notch IPS LCD 1080×2340 pixels display. Third, Its battery, Huawei Nova 3i gives you all day long 3340mAh Li-lon strong battery backup. Fourth, Huawei Nova 3i inside 4 GB of RAM and 128 GB of internal storage. Storage on the handset is expandable via micro SD card up to 256 GB. Fifth, Camera fact. 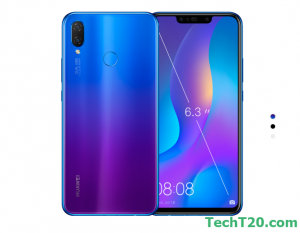 Huawei Nova 3i comes with four AI camera, 16+2 megapixel depth sensor dual rear cameras and dual 24+2 megapixel front-facing AI selfie cameras.